The envy of cheese lovers everywhere. Beginner & experienced collections. There aren’t many cheesemongers in America who put together a cheese selection like this. Few take the time to discover, select, age, care for and cut each cheese to order like we do. All the little steps add up—you really can taste the difference. 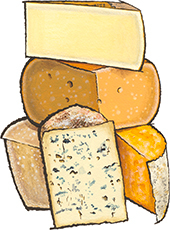 Five cheeses weigh in at about two and a half pounds, serving 18-20. Tucked in a gift bag with Sourdough Bread. Instructions for serving and care are included. The beginner assortment focuses on five great, well-aged versions of familiar cheeses like Marieke Gouda from Wisconsin and Antique Gruyère. The experienced assortment gathers more rare and adventurous cheese finds like Comté from Fort St. Antoine and Bayley Hazen Blue. The olive wood serving board is highly recommended: a beautiful, rustic, paddle-shaped Italian board. Hand made in the province of Liguria, cut across the tree on the bias, rough bark-edged, cured with olive oil. Each is unique. Gorgonzola Naturale and Sennerkase with Fenugreek.